In rigid beam method of analysis as discussed in early posts is a simple static method. There have some assumptions that make this method less appropriate for analyzing rafts. We will not discuss much about this method. We will have only summary of these method. In this method mat is considered as true rigid body which is the main limitation and this method is not supposed to model mat as in actual condition. With this limitation this method was used through the decades as it is simple and more refined method of modeling mat to represent actual situation was not available. Now with the help of electric calculation we can model mat nearly actual condition and this method is elastic or non rigid method. In this post we will learn only overall idea of non-rigid method of mat analysis. 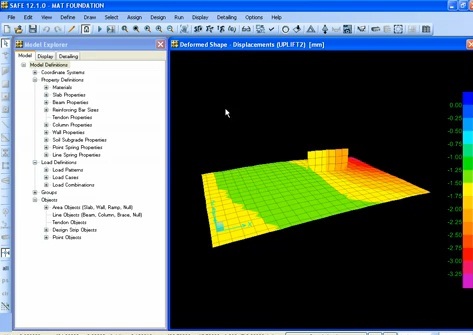 Of these, finite element method of analysis is the finest way to model and analyze mat. In this method mat are assumed as plate supporting on elastic foundation.